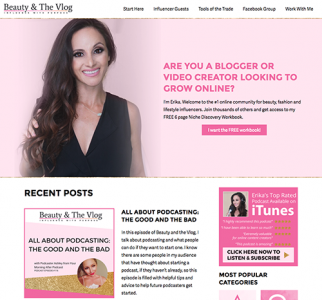 Complete custom website redesign for Beauty and the Vlog (Erika Vieira). Click the image to see the full homepage design. Custom sales page design for Erika Vieira's YouTube Bootcamp. Click the image to see the full sales page design. It was such a pleasure working with Anouska. She’s responsive, thorough and is great at what she does! I LOVE my new sales page. I’m really, really proud and happy with it! I raised my price and more people joined – my revenue went up 175%! 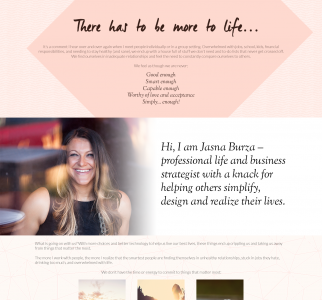 Sales page for Jasna Burza's Purpose Compass Formula. Membership site for Jasna Burza's Purpose Compass Formula. Anouska is very responsive, super detailed, helpful and extremely reliable – and my page is looking like a million bucks. I've done several customizations as well as support & maintenance for A Girl's Essence. TK later moved to Badass Beings and I continue to offer support for her. Anouska has been an absolute lifesaver to my sanity and has enabled me to focus on growing the business and creating things I love, rather than spending tedious, long hours in confusion and frustration trying to get my nerdy code hat on and decipher website forums. 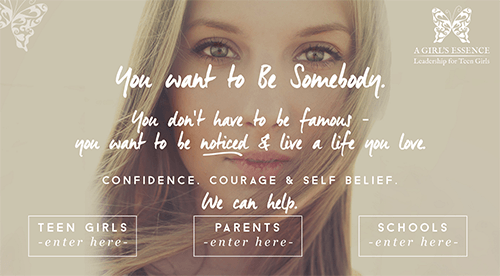 For Ashley of Your Super Awesome Life (site no longer available), I created a custom newsletter opt-in form that fit her existing brand. Anouska took my vague ideas and created a clean, simple, and fun design that totally reflects my brand. There is no doubt in my mind that this will be a huge factor to attract new clients in my business.